Growing and understanding local produce in the NT. 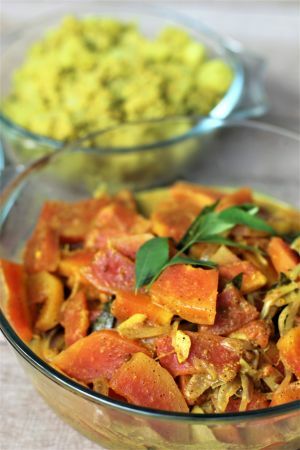 Darwin community cook, Karunika Premaratne creates fantastic curries with all the care, attention and wisdom that has been passed on for many generations within her family, and certainly as is customary throughout her home country. She migrated to Australia from Sri Lanka in 2009 and is delighted to share her knowledge with others. Her heritage defines all women as doctors. Traditional medicinal foods are at least 5000 years old, and cooking for the family entails taking into account their ages and health needs. There are roughly 2000 plants used for food and medicine in Sri Lanka and in the past there were about 2000 varieties of rice alone. Rice and other plants can still be nourished by an ancient complex irrigation system consisting of reservoirs fed by rain. Premaratne feels at home in tropical Darwin and embraces the tropical lifestyle with its unique blend of cultures and cuisines. She advocates eating locally-grown produce. It was exciting for her to find familiar fruits and vegetables like cassava, jack fruit, bananas, okra, coconut, fresh chilli and, of course, spices like turmeric, ginger, coriander and fennel here in Darwin. Her advice is not to overuse spices in terms of quantities in a dish. 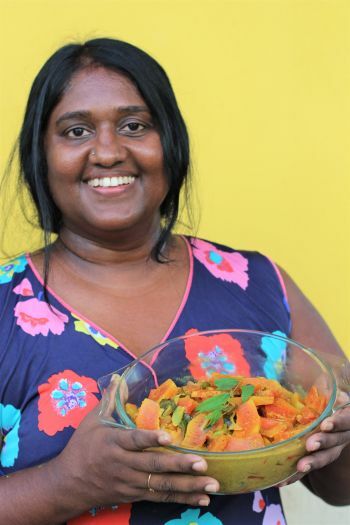 She has offered cooking classes and even had a stall of traditional Sri Lankan food lovingly prepared at 3am to ensure freshness at the Rapid Creek markets. Her interests also extend to Indigenous bush foods and she enriches her knowledge through field trips with local people. It was a pleasure to watch Premaratne prepare two varieties of papaya curry. Preparation, she said, is like meditation as you use patience and love! The meal served with rice was fragrant and delicious and shared with Gulp members in the edible garden of Premaratne’s home. Peel papaya and cut into chunks. Slice onion, chop chillies. Add all ingredients except coconut milk into a pan. Mix together and cook for 8-10 minutes until papaya becomes soft. Add coconut milk. Mix gently while cooking for another 5-8 minutes. Add salt and serve with rice. If you know a community cook in Darwin who would like to share their recipe, GULP NT can organise a gathering with their small team. $100 plus ingredients can be offered to the participating cook for hosting and sharing thanks to funding from the City of Darwin Community Grants. Get in touch today and share your stories and food love.